These are expansions for The Quest by Redshift, and they are all incredibly detailed, fully-featured classic role playing games. They can all be played as standalone games, but to play them in sequence is a lot more fun, plus you can keep useful items from earlier games, including The Quest and its other expansions. You can also continue to teleport to locations in the earlier games if you install them all through the main app. This is the original version of Zarista Games’ Escape from Asteroids Quest expansion with a terrain quite different from the later version and with many different adventures, quests, monsters and items. It’s been brought back by popular request and carefully balanced for a starting level of 17. 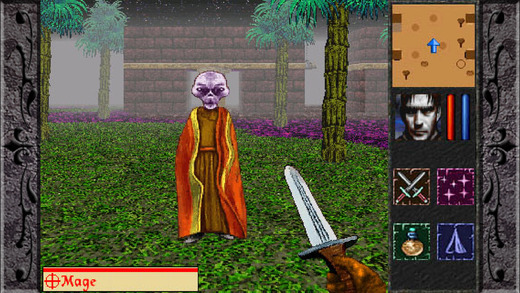 The game, as with all Quest games, can be played in portrait or landscape mode. You can also back up save files via iTunes. Your ship has run off course, Hero. You find yourself sucked into a black hole that warps you far away. The world you know so well is gone. It’s as though there were a huge explosion. All around you the asteroids appear on fire. You feel great pain and pass out . You wake up in a strange room with an unearthly creature looking down on you. You’re on Captain Hanty’s ship when suddenly the stars blow up around you. You sense a summons and feel great pain as you are sucked through the Abyss into another place and time. You have been called to the Asteroids once again. The Elemental Lord awaits you… You thought you killed Hemma but you only sent him to the Astral Plain — he’s back and has assembled a horror show of creatures who have captured the Asteroid Mage. It’s your mission to save her, but — you know the drill — it’s not going to be easy. There are monsters who love to hate you and puzzles and traps. It’s all in a day’s work.